Chrissie Hynde of the Pretenders performing Wednesday at Stifel Theatre in Saint Louis. Photo by Keith Brake Photography. 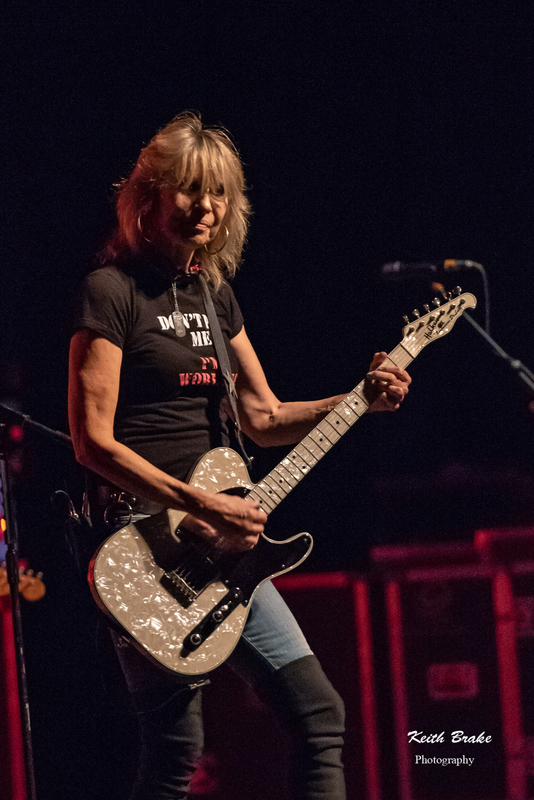 Chrissie Hynde, arguably one of the most influential women in rock, showed an energetic Saint Louis crowd that she is still on top of her game this past Wednesday (7/18/18). 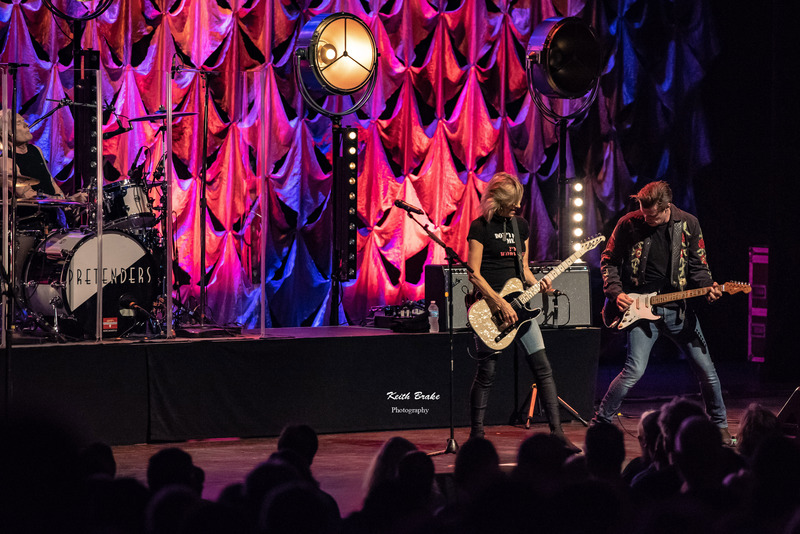 The Pretenders only have two remaining original members but Hynde, in unapologetic fashion, and drummer Martin Chambers have carried on this way since 1983 and show no signs of slowing down. The newly named Stifel Theatre, formerly Peabody Opera House, was the setting for what shaped up to be a great evening. After getting off to a bit of a late start the first act stepped onstage, a two piece acoustic duo named “The Rails”. The duo, hailing from London, showcases great vocals with excellent guitar skills to create a very enjoyable sound. I particularly enjoyed the obvious Celtic influences in their style. The large crowd was also in appreciation as each song was met with generous applause. The Pretenders performing Wednesday at Stifel Theatre in Saint Louis. Photo by Keith Brake Photography. To say that Chrissie Hynde has persevered in life would be an understatement; surviving drug addiction and being beaten and raped qualify for a little more in my mind. But from the ashes of this trauma, the great show I saw last Wednesday was born. Chrissie still sounds as powerful and clear as she ever has…and at the age of sixty four. She also has tremendous charisma when she works the stage and the crowd, she grabs you and holds you tight; pulls you into the performance. Chrissie and the rest of Pretenders are excellent musicians and performers, engaging and entertaining. At a moment in between songs Chrissie noticed a fan wearing a shirt with Wendy O Williams (vocalist for the Plasmatics). Hynde expressed her appreciation for Williams also being a trailblazer for women in music as one of the first females fronting a punk rock band, and then dedicated “Back on The Chain Gang” to Williams. It seems more than obvious to say the evening was loaded with great music given the catalog The Pretenders have to offer, but I will say it anyway, they were great the entire show. Hynde and the rest of the London rockers gave the audience what they came for and a lot of it as the show featured two encores before they sent the faithful home for the evening. To be in the presence of someone like Hynde makes for a special evening, something I would recommend to anyone if you get the opportunity. Icons are Icons with good reason and Hynde still delivers in spades, perhaps better now than ever. Thanks for the continued support, check out the images after the set list! The Rails performing Wednesday at Stifel Theatre in Saint Louis. Photo by Keith Brake Photography.